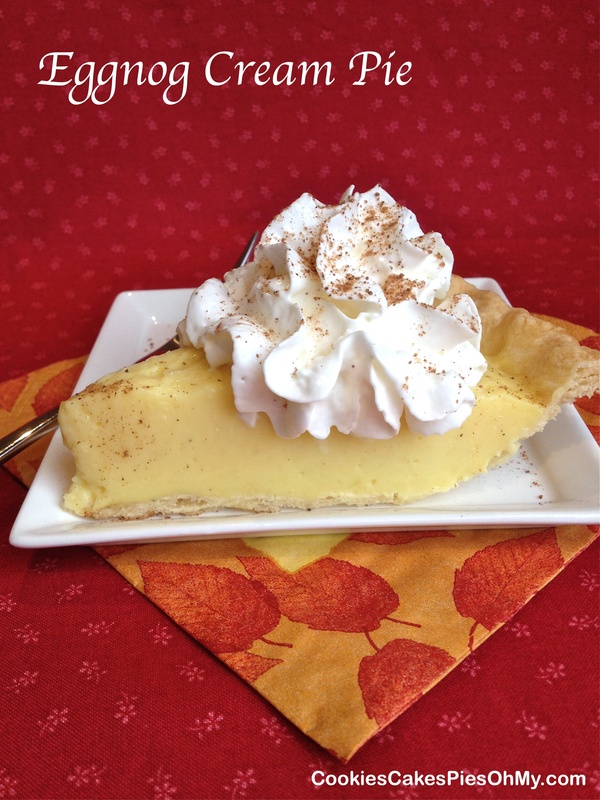 I wish you a Thanksgiving filled with love, family, gratitude, peace, and pie! Combine eggnog, sugar, cornstarch, and salt in large saucepan. Heat over medium heat to boiling, stirring constantly. Add a small amount of hot milk mixture to egg yolks to warm (whisking constantly), and then add egg yolks to milk mixture (whisking constantly). Boil 1 minute stirring constantly till thick and smooth. Remove from heat and add butter, vanilla, and nutmeg. Beat several times while cooling a bit. Pour eggnog filling into baked pie shell while slightly warm. Cover with wax paper. Cool completely in refrigerator until set for clean slices. 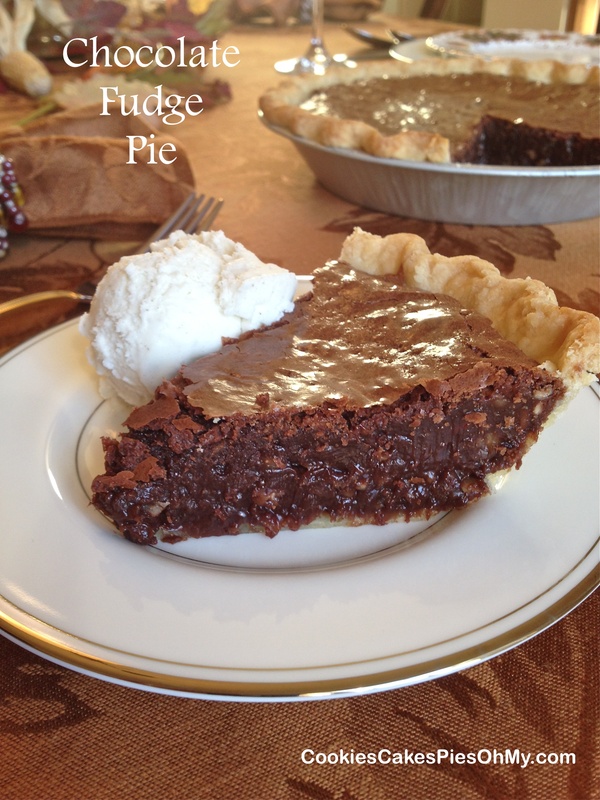 Serve with whipped cream and a sprinkle of nutmeg. Combine flour, sugar, and salt. Cut shortening into flour mixture. Add water 1 Tbl at a time, stirring with a fork. When dough comes together, shape into a disk and refrigerate for about an hour. 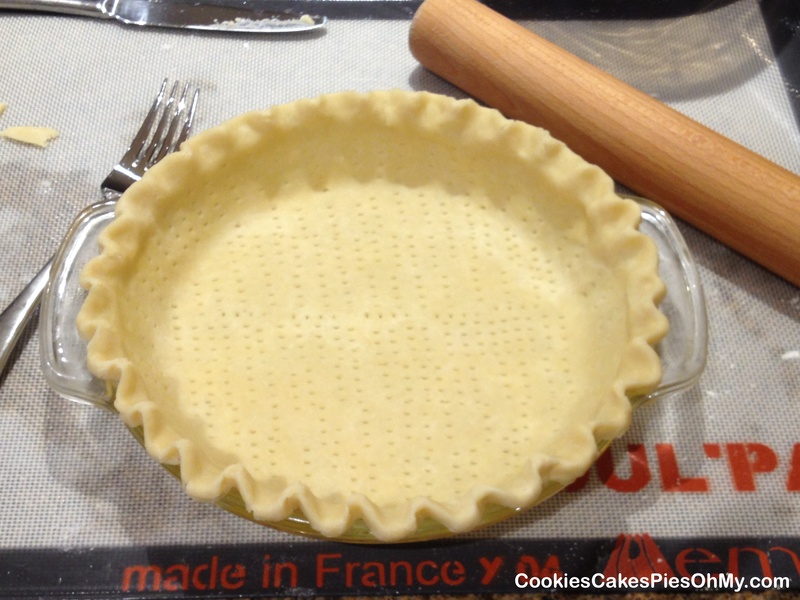 Roll out on well floured surface, place in pie plate, crimp edges. 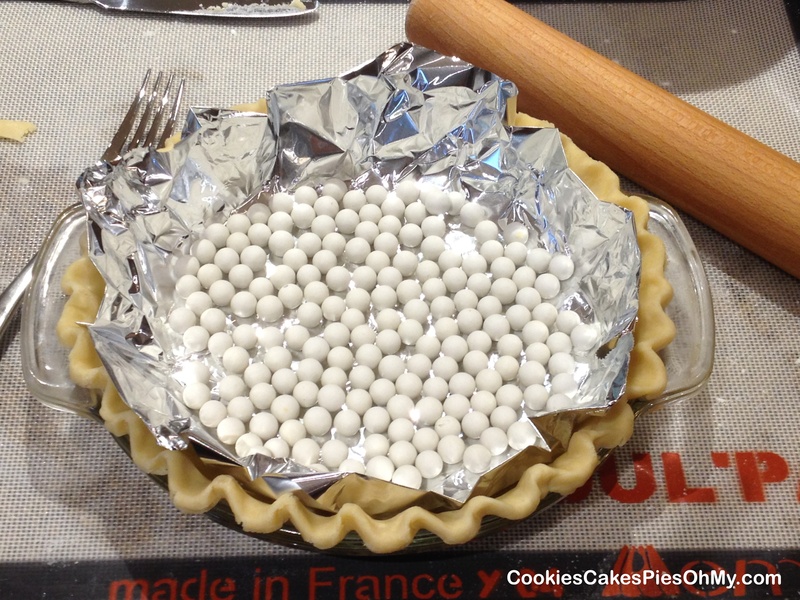 Poke with fork, lay foil gently down inside, place pie weights (or dry beans). Bake in 425° preheated oven for 10 minutes. Gently take out foil with weights, turn heat down to 350° and bake 10 minutes more. 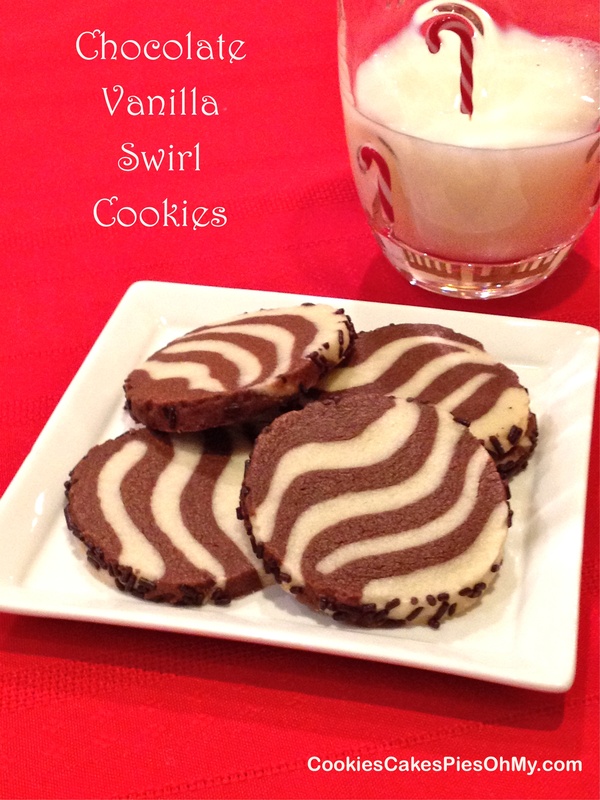 OK, my Chocolate Vanilla Swirl Cookies are more like Chocolate Vanilla Zebra Cookies or Chocolate Vanilla Wave Cookies, but I still like them. I will work on my swirling technique. These cookies look great and they taste great! They taste like a very tender shortbread, they melt in your mouth. The recipe comes from the book Baking for All Occasions. With electric mixer on lowest setting, combine butter and powdered sugar. Add vanilla, mix. Add flour and salt, mix. Mixture will be very crumbly, keep mixing on lowest speed, keep mixing, keep mixing, it will come together (trust me). When dough comes together, make into a ball and refrigerate for 15 minutes. With electric mixer on lowest setting, combine butter and powdered sugar. Add vanilla, mix. Add flour, cocoa and salt, mix. Again, mixture will be very crumbly, keep mixing on lowest speed, keep mixing, keep mixing, it will come together (trust me, again). When dough comes together, make into a ball and refrigerate for 15 minutes. Divide vanilla dough into thirds. 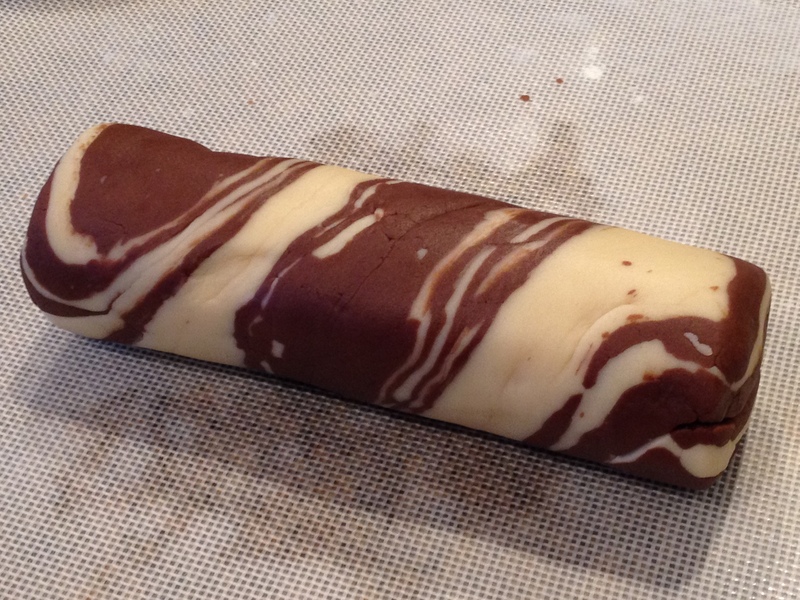 Divide chocolate dough into thirds. 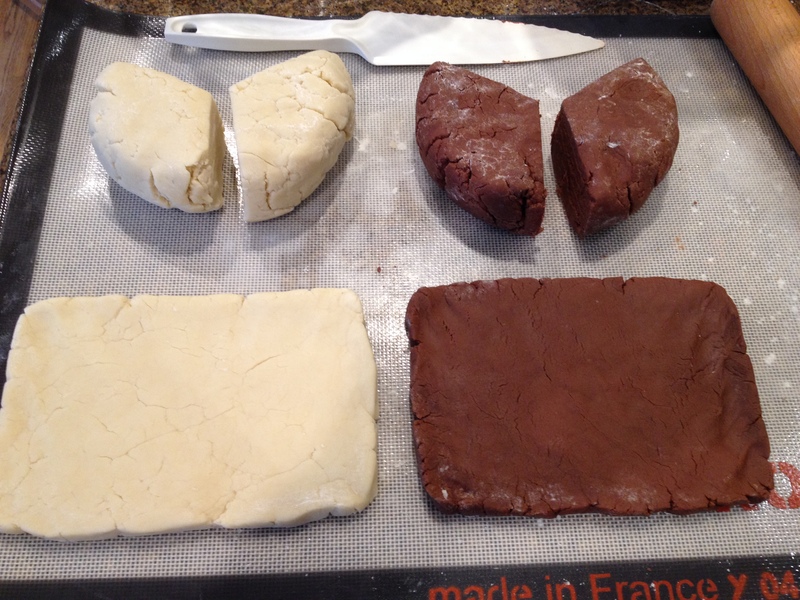 Flatten each dough piece with your fingertips into a 7″x5″ rectangle. 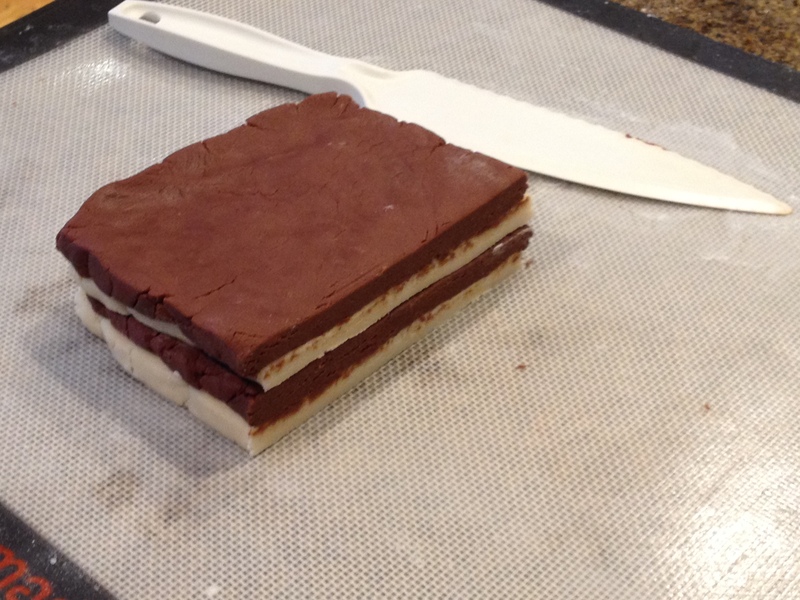 Place a chocolate rectangle on top of a vanilla rectangle, and then cut the stack in half, to create 2 pieces each about 3½”x5″. Place one half on top of other half to create 4 layers alternating colors. Pat the stack into a 9″x 4″ rectangle. Cut the stack in half lengthwise to create two 9″x 2″pieces. 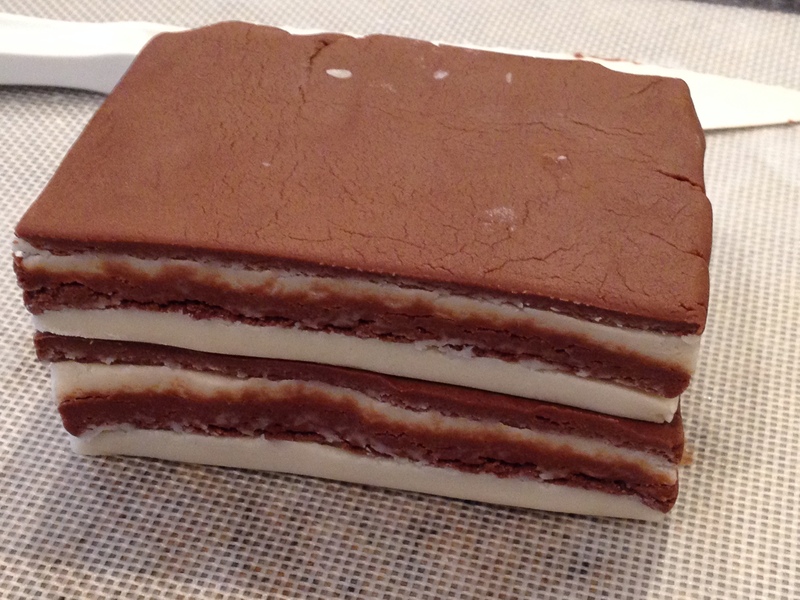 Place 1 piece on top of the other to create a stack with 8 layers. Using both hands, twist the dough about three times and at the same time gently extend the dough package. Have each hand at a different point on the dough package as you manipulate it into a swirled pattern. Repeat the process with the remaining dough to form 2 more logs. Compress each log so it is rounder, more uniformly shaped, and about 8 inches long. 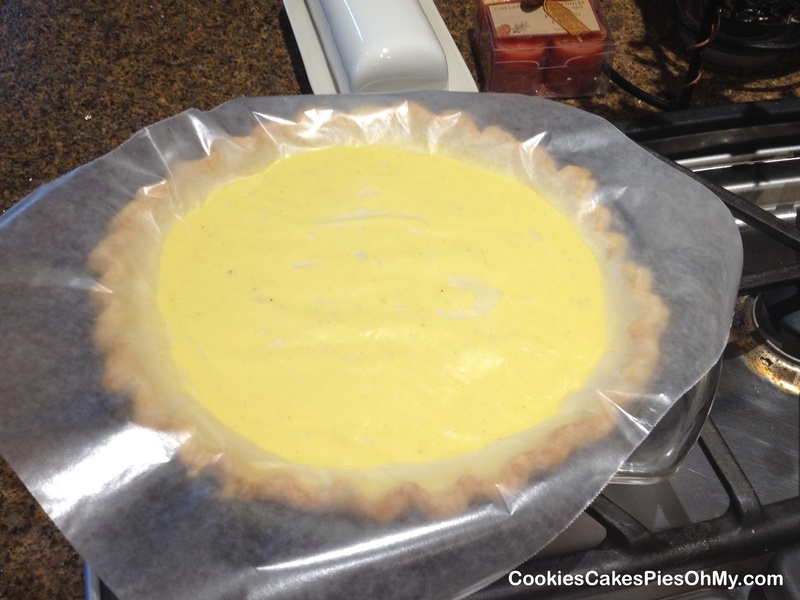 Spread the sprinkles in a pan (I used a 9″x9″ square pan). 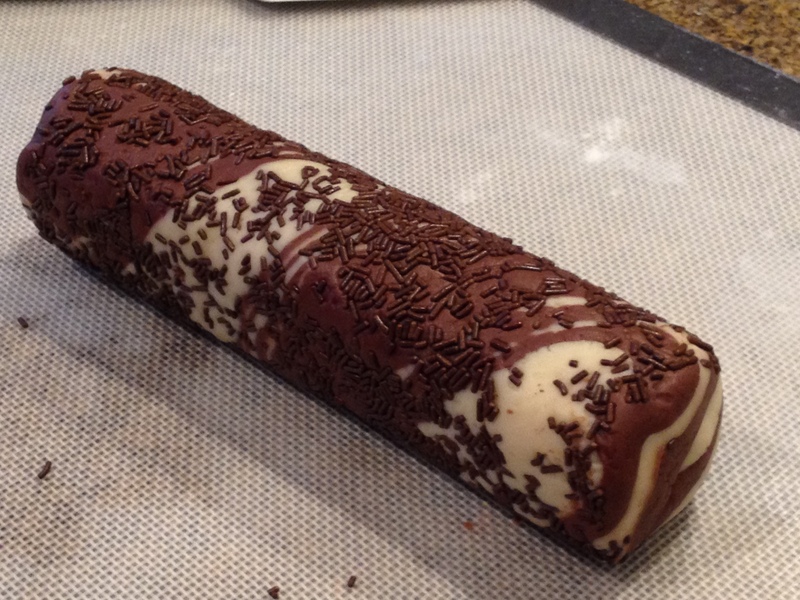 Roll each dough log back and forth in the sprinkles to coat the outside of the log evenly, pressing sprinkles gently into dough to stick. Wrap each log in plastic wrap and refrigerate until firm at least 1 hour. Preheat oven to 325°. Line baking sheets with parchment or silpat. 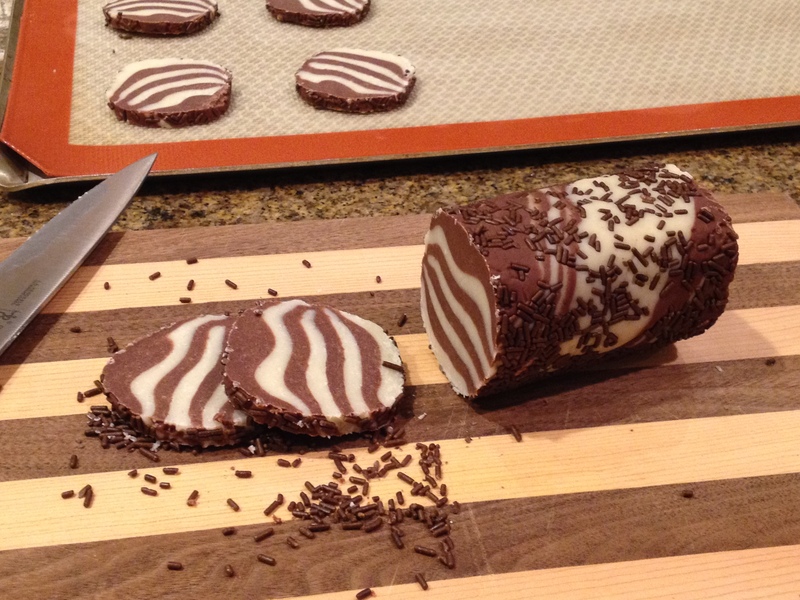 Using sharp knife, cut 1/4″ thick slices from log and arrange on baking sheet, spacing them at least 1/2″ apart. Bake 10 to 12 minutes, just until they are no longer shiny on top and are lightly golden on the bottom. Don’t let them start to brown on top. Cool on baking sheet for 5 minutes, transfer to wire rack and let cool completely. It is the holiday season, time for celebration and family. Decorating traditions, homemade delights, and heavenly aromas. Here is an old fashioned recipe to get things rolling. Butter 9″x9″ square pan; set aside. 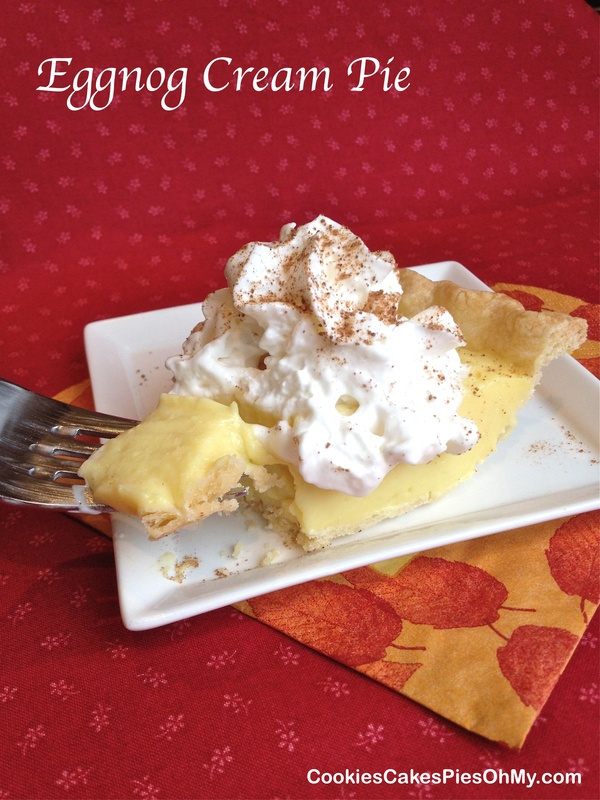 Combine butter, sugar, brown sugar, milk, whipping cream, and corn syrup in heavy saucepan. Cook over low heat, stirring occasionally, until butter is melted. Raise heat by slow increments to medium and bring mixture slowly to boil. This is the patience part, do not rush, you do not want mixture to heat too fast and burn on bottom of pan. 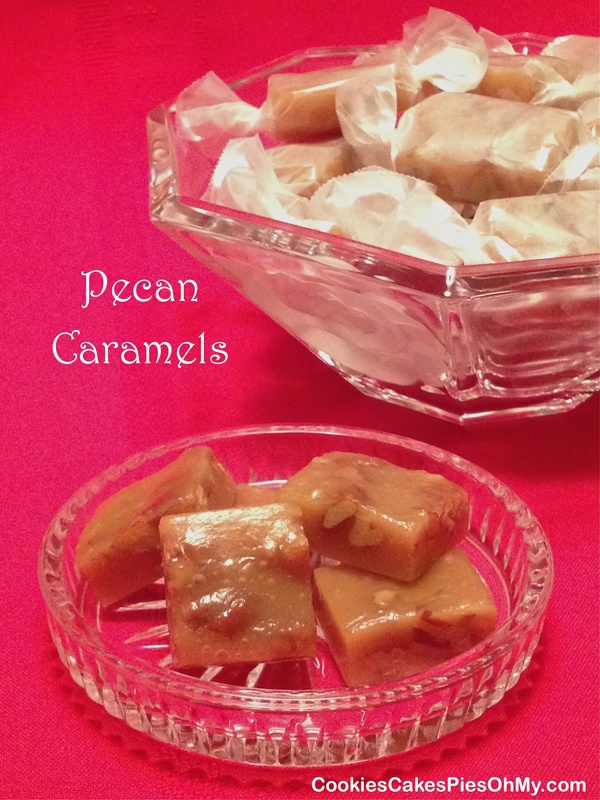 Continue cooking until candy thermometer reaches 242°F, process may take 25-30 minutes. Remove from heat; stir in vanilla and nuts. Pour into prepared pan. Cool completely. Cut with sharp knife into 1½”x1″ pieces (or how you want), wrap in wax paper.